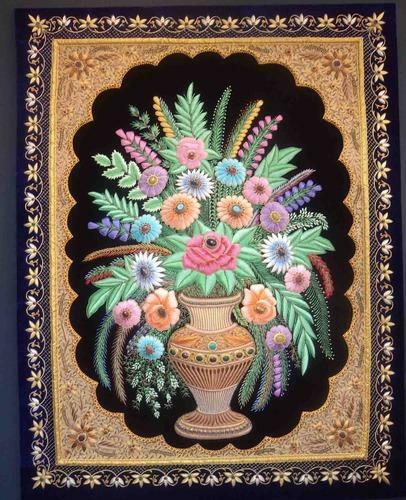 Silk/Zari Jewel Carpet made by hand embroidery. It can use for Home decoration with frame or without frame as an wall hanging. Its look natural it is for Royal families to decorate there bed rooms. Being in the industry for a decade, we, Worldwide Exports have gained prominence for offering a quality range of Handicrafts and Home Furnishing items. Our wide assortment includes Bed Cover, Curtain, Cushion Covers, Placemats, Fashion Items, Pouch, Runner, Table Cover and Tissue Box Cover. These combine both the traditional as well as contemporary designs and unfold the saga of fine craftsmanship. Our fascinating array is available in various sizes, colors & styles conforming to the ethnic as well as contemporary trend. We are backed by number of in-house Juki machines and Indian umbrella machines that enable us to meet the bulk and urgent requirements of our clients. Moreover, our unsurpassed range of Handicrafts and Home Furnishing products has gained us renown in the fashion industry. Furthermore, our ethical business policies, timely delivery & customization have gained us a wide client base not only in India but also in Middle East and Europe.